It's no secret that I'm a big fan of LUSH, so the recent launch of their seasonal Halloween and (dare I say it) Christmas products got me a little bit excited. I haven't had chance to pop into store yet to have a look at the physical products but I hope to do so very soon. 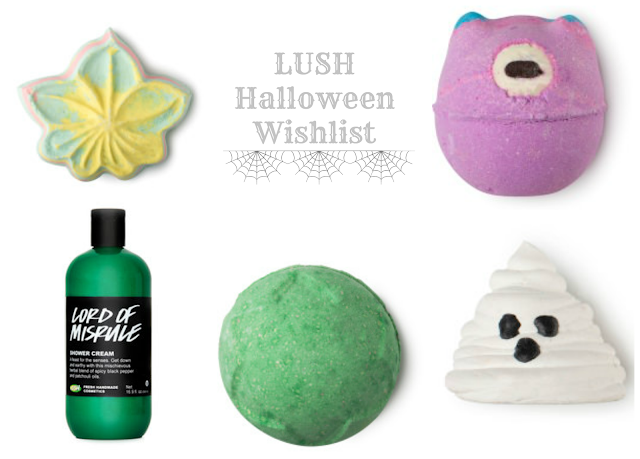 In the meantime I thought I'd share my LUSH Halloween wishlist. I've seen the Autumn Leaf bath bomb appearing on Instagram quite frequently lately and I think it looks oh so pretty. After looking at the ingredients online this seems like it would have a lovely fresh scent and I can't wait to have a sniff. The product which really caught my eye in this years Halloween collection was the Monsters' Ball bath bomb, I think it looks kinda cute (can I say that about a bath bomb?) and I can imagine it transforms the water into a lovely pool of colour once it's popped into the bath. This Halloween sees the return of the Lord of Misrule bath bomb and the Lord of Misrule shower cream, which just happen to be two of my all time favourite LUSH products so I'd definitely like to stock up on them before they leave us for another year. The final product that I have my eye on from the Halloween collection is the Boo bath melt, which I also think looks cute (yes I'm going with calling bath products cute, ha) and I think this would be a lovely skin softening treat. Have you picked up anything from the LUSH Halloween collection? I'd love to know your thoughts.